Just when we thought blogger style couldn't get any better, the start of New York Fashion Week totally proved us wrong. 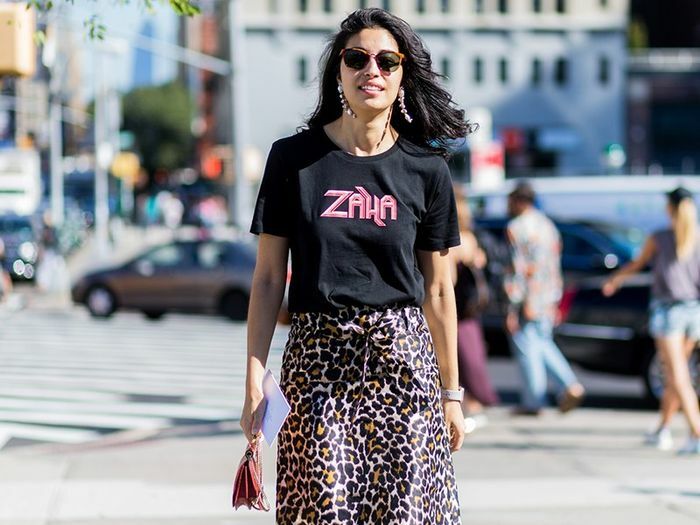 In an effort to carve out new trends, create great street style photos, and support some of their favorite brands and designers, fashion bloggers across the board are stepping up their outfit games in ways we've never seen before. Whether their looks feature trends from head to toe or are on the more subdued side, there are notes to be taken on these stylish outfits. Since fashion week has just begun, we're looking forward to seeing what else these influencers have up their sleeves, but for now, take time to look through some of the best outfits so far. Keep reading to shop some of our favorite looks from the bloggers at New York Fashion Week. On Danielle Bernstein: Suno Patterned Ruffle Mini Skirt ($695); Anine Bing boots. Pair this with something unexpected, like a floral skirt. This material is to die for! Metallic boots are about to be huge this season. On Jessie Bush: Amber Sceats earrings; JH.Zane top; Larsson & Jennings watch; House of Sunny Fit and Flare Culottes ($54); Loeffler Randall heels. Dainty straps will always make your shoulders look more elegant. A unique color in a classic shape. Furry feet are more fun. Statement earrings are the perfect addition to any look. On Michelle Madsen: Garrett Leight Wilson Sun Shield Sunglasses ($455); Cinq à Sept Vega Sleeveless A-Line Dress ($495); Chloè Faye Medium Flap Shoulder Bag ($1950); Schutz shoes. This is the perfect style to dress up or down with ease. Like with these loafers, for example! Leave it to Miu Miu to create the perfect turtleneck. How cool is that heel? On Arielle Charnas: Marissa Webb Elise Dress ($315); Brian Atwood shoes; Sunday Somewhere Ned Sunglasses ($290); Fendi Peekaboo Medium Satchel Bag ($3950). You can't help but smile when looking at this cheery color. Your LBD is in dire need of these festive heels. Now this is what we call an investment piece. On Natalie Suarez: Lucky Brand Wrap Dress ($148); By Far Scandi Strap Green Heel ($288). We love the vintage vibe this dress gives off. You could walk for days in these low-heel mules. On Olivia Lopez: Aurelie Bidermann bracelet; Trademark skirt; Clare V. Alice Bag ($199); Balenciaga sandals. Feminine tops like this look great paired with old-school denim. A rich navy skirt like this will balance out more shades in your closet than you realize. Staple shoes on sale?! Yes, please. This summer bag will also do wonders in the fall. On Alyssa Lau: Eliza Faulkner dress; Prada shoes. Wear a turtleneck under this dress to make it appropriate for cooler weather. Toughen up these classic shoes with jeans and a tee. On Mary Seng: Tim Coppens jacket; Alexander Wang yop; Zara Trousers with Side Band ($100); M2Malletier Amor Fati Leather Shoulder Bag ($1685). This silky smooth bomber is irresistible. Whether you tuck this in or wear it out, this button-down can do no wrong. These pants are seriously cool. The handle alone sold us. Check out the latest street style shots from New York Fashion Week!